충주 단호사 철조여래좌상(忠州 丹湖寺 鐵造如來坐像)은 단호사 대웅전에 모셔져 있는 철불좌상이다. 단호사는 창건연대를 알 수 없으나 조선 숙종 때 중건하여 약사(藥寺)라 하였고, 1954년에 단호사로 이름을 바꾸어 사용하고 있다. 머리에는 상투 모양의 머리(육계)가 큼직하게 자리잡고 있으며, 머리 가운데에는 고려시대 불상에서 자주 보이는 반달 모양을 표현하였다. 긴 타원형의 얼굴에는 눈·코·입이 단아하게 묘사되었으며 두 귀는 길게 표현되고 목에는 3개의 주름이 분명하게 표현되었다. 양 어깨에 걸쳐 입은 옷은 다소 두꺼운 편이고 옷주름은 간략한 몇 개의 선으로 표현하고 있다. 특히 가슴에 묘사된 띠매듭은 고려말 조선초부터 나타나는 수평적인 처리에 근접하고 있다. 좁고 둥근 어깨와 평평한 가슴의 상체는 4각형의 각진 모습이다. 하체는 양 발을 무릎 위에 얹어 발바닥이 하늘을 향하고 있는 모습이며 무릎에 표현된 평행한 주름은 상당히 형식적이다. 얼굴부분의 세부 표현기법과 머리에 나타난 반달 모양 등은 고려시대 불상의 특징을 반영하고 있으며, 여기에 도식적이고 특이한 옷주름 처리, 각진 상체 표현 등 지방색이 더해진 작품이다. 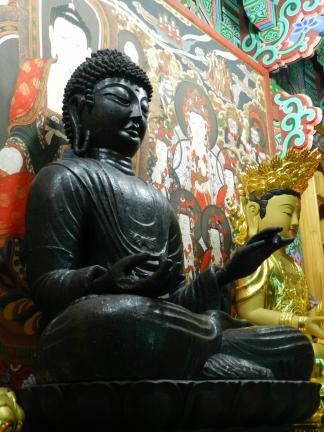 This iron seated Buddha is enshrined in the Daeungjeon Hall of Danhosa Temple in Chungju. Though the year of the temple’s construction is unknown, it was repaired, at that time called Yaksa Temple, during the reign of King Sukjong (r. 1674~1720) of the Joseon Dynasty, and then renamed Danhosa in 1954. A large usnisa (a protuberance symbolizing supreme wisdom) can be seen on top of the Buddha’s head, and in the middle of the head is a half-moon shape, a feature commonly found in Buddha statues made during the Goryeo Dynasty. The oval face, the eyes, nose, and mouth are all gracefully expressed. The ears are elongated, and the samdo, i.e. the three wrinkles on the neck, can be seen clearly. The Buddha’s beobui (sacerdotal robe), draped over both shoulders, gives a heavy impression. The folds in the garments are expressed simply in a few lines. The strap and knot depicted horizontally on the chest are similar to those on statues from the end of the Goryeo to the early Joseon Dynasty. The upper body is rectangular in shape with narrow, round shoulders and a flat chest. The legs have the knees laid flat with the soles of feet facing upwards. The horizontal wrinkles apparent on the knees are quite formal. 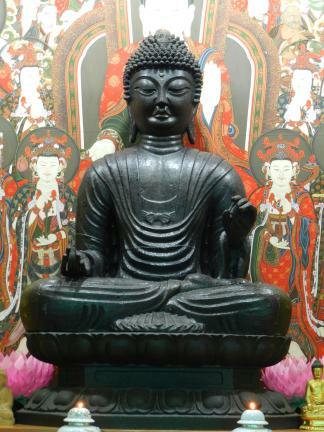 The detailed expression of the face and the half-moon pattern above the forehead are characteristic of the Buddha statues made during the Goryeo Dynasty. In addition, the unusual expressions of the folds in the garments and of the angular upper body show that the statue also has particular regional characteristics.